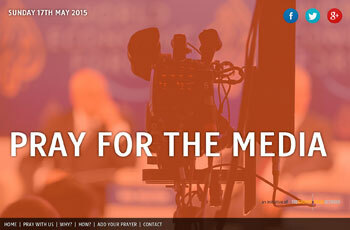 On Sunday (17 May 2015) people across the country will pray for the media. The initiative is a project of the Church and Media Network – which aims to build bridges between the media and the Christian community. This year a special focus is on praying for media professionals working in dangerous circumstances in the Middle East and other conflict zones. The recent murders of reporters, camera people and others highlights just how dangerous that can be. The Network is also encouraging churches to remember the countless important jobs which done here at home, often unnoticed and not well-paid, secure or with an on-screen role. New prayers for 2015 have been commissioned from Steve Clifford (General Director of the Evangelical Alliance), Revd Kenneth Howcroft and Mrs Gill Dascombe (President and Vice President of the Methodist Conference), Revd Dr Karin Achtelstetter (General Secretary of the World Association for Christian Communication), Bishop Ephraim Tendero (General Secretary of the World Evangelical Alliance) and Mark Meynell (Writer, Speaker and Ministry Trainer).